Australians are the most deal-driven travelers within Asia-Pacific, but given that they travel the most and are more likely to travel abroad, they invest in travel and are likely looking to get the most bang for their buck. According to our new study with Northstar Research Partners, Australian travelers prioritize activities, deals and low prices, once in a lifetime or “bucket list” trips and cultural experiences, and approximately 48 percent plan and book their trip via an online travel agency (OTA). 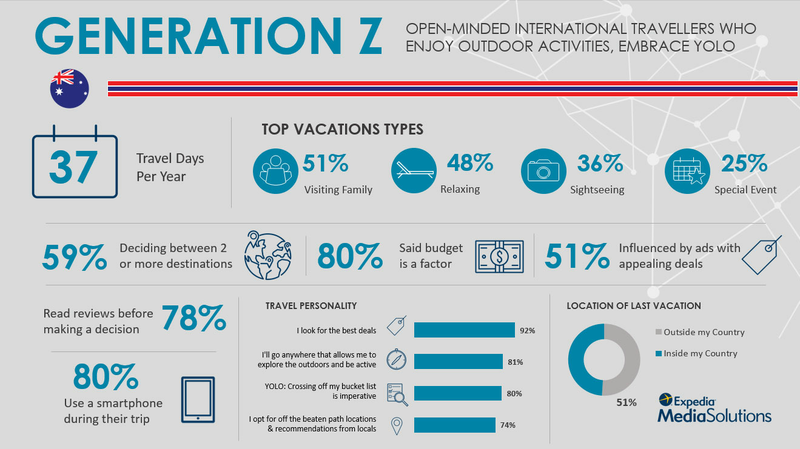 Australian Gen Z travel 37 days a year on average, and are the most likely of all the generations to travel internationally (51 percent). 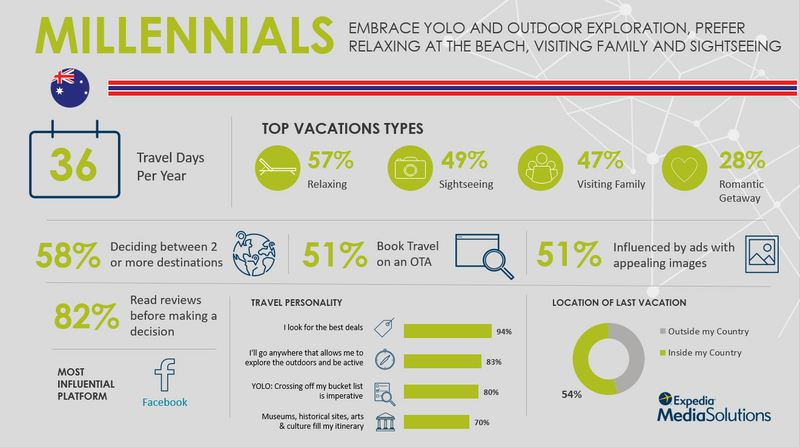 Gen Z opt for "off the beaten path" locations (74 percent) and recommendations from locals and embrace the ‘you only live once’ (#YOLO) mentality, take risks and focus on crossing things off their travel wish list. Two-thirds of Millennials either do not have a destination in mind when beginning to plan a trip, or are considering multiple destinations. 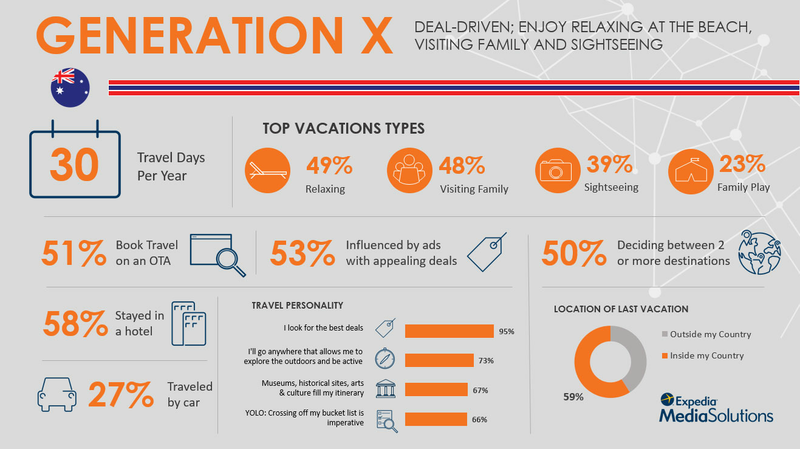 The majority (70 percent) said every vacation is family oriented and they prefer to fill their itinerary with museums, historical sites, arts and culture. More than half are influenced by ads with appealing imagery and consider Facebook the most influential social media platform for travel inspiration. Gen X travel almost one full week less than other generations, and are more likely to travel domestically (59 percent stay in country). Their top trip types including relaxing vacations and visiting family, and over half book their travel on an OTA. Baby Boomers are the most destination decisive of the generations with 67 percent saying they have already decided on a destination when beginning to shop for travel. 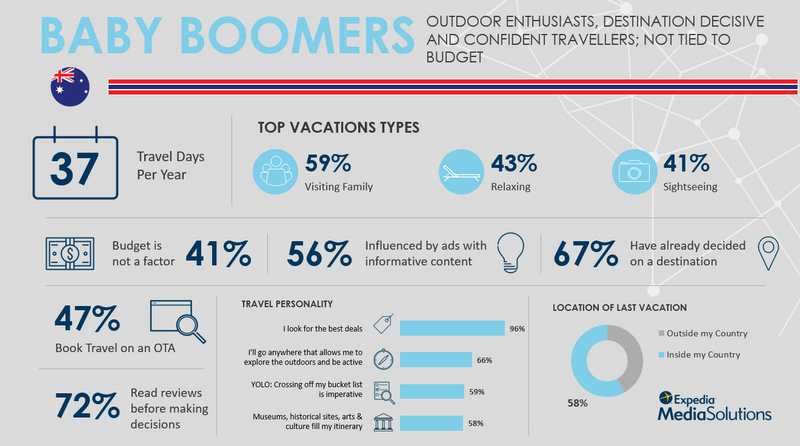 Less than half said budget is not a primary factor when travel shopping, and Boomers allocate the largest portions of thier budget to flight and hotel. 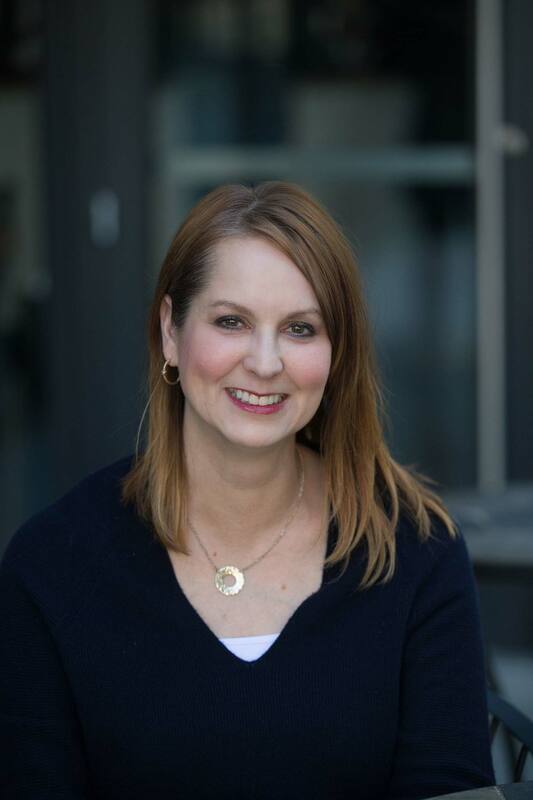 While the majority of Boomers said they are not influenced by social media (76 percent), more than half are influenced by ads with informative content.